- Meet & Greet: Contests will begin on April 25 at 9 AM PDT and will end on May 2 at 9 AM PDT. - Snake Pit: Contests will begin on April 25 at 9 AM PDT and will end on May 2 at 9 AM PDT. 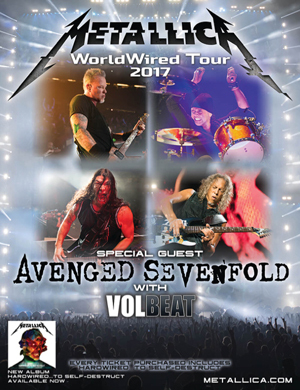 METALLICA recently announced their WorldWired 2017 North American Tour in support of their new album Hardwired...To Self-Destruct. The WorldWired 2017 tour is produced by Live Nation and kicks off on May 10th in Baltimore, MD at M&T Bank Stadium. The tour will crisscross its way across North America into the summer, marking the Rock and Roll Hall of Fame inductees and Grammy Award winning band’s first proper North American tour since 2009. AVENGED SEVENFOLD and VOLBEAT will be the main support acts for the tour run. See below for a list of all confirmed dates. Every ticket purchased through official outlets includes your choice of a standard physical or standard digital copy of Hardwired...To Self-Destruct. Fans should expect to receive information from Warner Music Artist Services on how to redeem their albums within 14 business days after their purchase. Full details of how you can gift the album, should you have already purchased, will be given on the redemption page. METALLICA has also partnered with CID Entertainment to offer four options of special enhanced experiences on this tour, including premium tickets and amenities, including: early access to the venue, a visit to the 'Memory Remains' exhibit of memorabilia, and meet and greets. Go HERE for full package details. Additionally, METALLICA has announced the formation of their All Within My Hands Foundation, which will raise funds to support a cross-section of national, local and Bay Area charities that the individual band members support, along with continuing to donate to music education programs and local food banks. Through a collaboration with Crowdrise, the band encourages fans to make a donation when purchasing tickets to the upcoming shows. For more information, head to crowdrise.com/metallica.